Rolinek, M., Zietlow, D., Martius, G.
The Variational Autoencoder (VAE) is a powerful architecture capable of representation learning and generative modeling. When it comes to learning interpretable (disentangled) representations, VAE and its variants show unparalleled performance. However, the reasons for this are unclear, since a very particular alignment of the latent embedding is needed but the design of the VAE does not encourage it in any explicit way. We address this matter and offer the following explanation: the diagonal approximation in the encoder together with the inherent stochasticity force local orthogonality of the decoder. The local behavior of promoting both reconstruction and orthogonality matches closely how the PCA embedding is chosen. Alongside providing an intuitive understanding, we justify the statement with full theoretical analysis as well as with experiments. Botella-Soler, V., Deny, S., Martius, G., Marre, O., Tkačik, G.
Author summary Neurons in the retina transform patterns of incoming light into sequences of neural spikes. We recorded from ∼100 neurons in the rat retina while it was stimulated with a complex movie. Using machine learning regression methods, we fit decoders to reconstruct the movie shown from the retinal output. We demonstrated that retinal code can only be read out with a low error if decoders make use of correlations between successive spikes emitted by individual neurons. These correlations can be used to ignore spontaneous spiking that would, otherwise, cause even the best linear decoders to “hallucinate” nonexistent stimuli. This work represents the first high resolution single-trial full movie reconstruction and suggests a new paradigm for separating spontaneous from stimulus-driven neural activity. Haptic sensation is an important modality for interacting with the real world. This paper proposes a general framework of inferring haptic forces on the surface of a 3D structure from internal deformations using a small number of physical sensors instead of employing dense sensor arrays. Using machine learning techniques, we optimize the sensor number and their placement and are able to obtain high-precision force inference for a robotic limb using as few as 9 sensors. For the optimal and sparse placement of the measurement units (strain gauges), we employ data-driven methods based on data obtained by finite element simulation. We compare data-driven approaches with model-based methods relying on geometric distance and information criteria such as Entropy and Mutual Information. We validate our approach on a modified limb of the “Poppy” robot  and obtain 8 mm localization precision. Sahoo, S. S., Lampert, C. H., Martius, G.
We present an approach to identify concise equations from data using a shallow neural network approach. In contrast to ordinary black-box regression, this approach allows understanding functional relations and generalizing them from observed data to unseen parts of the parameter space. 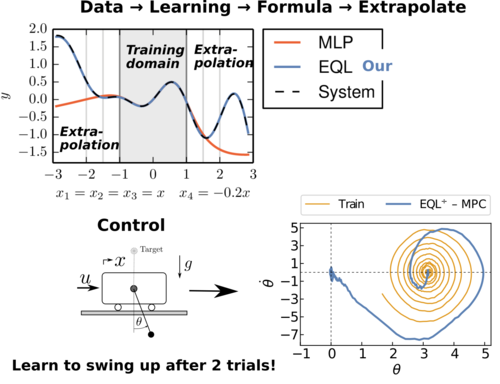 We show how to extend the class of learnable equations for a recently proposed equation learning network to include divisions, and we improve the learning and model selection strategy to be useful for challenging real-world data. For systems governed by analytical expressions, our method can in many cases identify the true underlying equation and extrapolate to unseen domains. We demonstrate its effectiveness by experiments on a cart-pendulum system, where only 2 random rollouts are required to learn the forward dynamics and successfully achieve the swing-up task. Martius, G., Lampert, C. H.
Grounding autonomous behavior in the nervous system is a fundamental challenge for neuroscience. In particular, self-organized behavioral development provides more questions than answers. Are there special functional units for curiosity, motivation, and creativity? This paper argues that these features can be grounded in synaptic plasticity itself, without requiring any higher-level constructs. 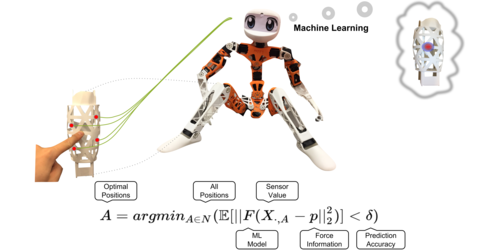 We propose differential extrinsic plasticity (DEP) as a new synaptic rule for self-learning systems and apply it to a number of complex robotic systems as a test case. Without specifying any purpose or goal, seemingly purposeful and adaptive rhythmic behavior is developed, displaying a certain level of sensorimotor intelligence. These surprising results require no system-specific modifications of the DEP rule. They rather arise from the underlying mechanism of spontaneous symmetry breaking, which is due to the tight brain body environment coupling. The new synaptic rule is biologically plausible and would be an interesting target for neurobiological investigation. We also argue that this neuronal mechanism may have been a catalyst in natural evolution. Martius, G., Jahn, L., Hauser, H., V. Hafner, V.
Martius, G., Herrmann, J. M.
Martius, G., Hesse, F., Güttler, F., Der, R.
Martius, G., Nolfi, S., Herrmann, J. M.
Martius, G., Fiedler, K., Herrmann, J.
Martius, G., Herrmann, J. M., Der, R.
Der, R., Martius, G., Hesse, F.
Self-organization and the phenomenon of emergence play an essential role in living systems and form a challenge to artificial life systems. This is not only because systems become more lifelike, but also since self-organization may help in reducing the design efforts in creating complex behavior systems. The present paper studies self-exploration based on a general approach to the self-organization of behavior, which has been developed and tested in various examples in recent years. This is a step towards autonomous early robot development. We consider agents under the close sensorimotor coupling paradigm with a certain cognitive ability realized by an internal forward model. Starting from tabula rasa initial conditions we overcome the bootstrapping problem and show emerging self-exploration. Apart from that, we analyze the effect of limited actions, which lead to deprivation of the world model. We show that our paradigm explicitly avoids this by producing purposive actions in a natural way. Examples are given using a simulated simple wheeled robot and a spherical robot driven by shifting internal masses. Der, R., Hesse, F., Martius, G.
Dynamical systems offer intriguing possibilities as a substrate for the generation of behavior because of their rich behavioral complexity. However this complexity together with the largely covert relation between the parameters and the behavior of the agent is also the main hindrance in the goal-oriented design of a behavior system. This paper presents a general approach to the self-regulation of dynamical systems so that the design problem is circumvented. We consider the controller (a neural net work) as the mediator for changes in the sensor values over time and define a dynamics for the parameters of the controller by maximizing the dynamical complexity of the sensorimotor loop under the condition that the consequences of the actions taken are still predictable. This very general principle is given a concrete mathematical formulation and is implemented in an extremely robust and versatile algorithm for the parameter dynamics of the controller. We consider two different applications, a mechanical device called the rocking stamper and the ODE simulations of a "snake" with five degrees of freedom. In these and many other examples studied we observed various behavior modes of high dynamical complexity. Despite the tremendous progress in robotic hardware and in both sensorial and computing efficiencies the performance of contemporary autonomous robots is still far below that of simple animals. This has triggered an intensive search for alternative approaches to the control of robots. The present paper exemplifies a general approach to the self-organization of behavior which has been developed and tested in various examples in recent years. We apply this approach to an underactuated snake like artifact with a complex physical behavior which is not known to the controller. Due to the weak forces available, the controller so to say has to develop a kind of feeling for the body which is seen to emerge from our approach in a natural way with meandering and rotational collective modes being observed in computer simulation experiments.